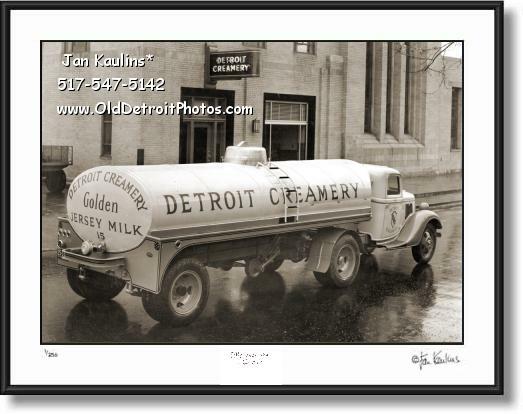 OLD DETROIT CREAMERY TRUCK photo picture print for sale. This is a historic 1935 FORD GAR WOOD TRACTOR TRAILER hauling a 1,800 gallon load of milk from THE DETROIT CREAMERY, in front of which it is parked. This is a quite unique item. You can readily read the sign at the top of THE DETROIT CREAMERY building. Founded in 1897, The Detroit Creamery Company had the largest dairy processing plant in the state and was considered by many to be the cleanest plant in the country. Every day 303 wagons with teams of horses left their plant and made a total of 50,000 stops, selling more than 20,000 gallons of milk. By 1916 they began using motor trucks for wholesale deliveries.” This is a photo of one of their large trucks in 1935.